Slots Heaven Casino is essentially the best place to fulfill all your gaming needs. The casino was formed in the year 2013 and is under the ownership of the Mansion Group. The casino is fully certified by the UK Gambling Commission. The casino offers different game types such as slot games, video poker, and table games. They also have offers and bonuses for its members. 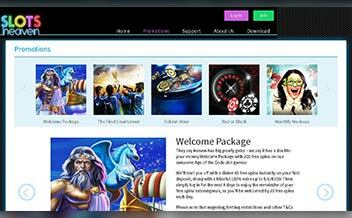 The casinos’ site is welcoming as it has dazzling colors and amazing graphics displaying its name. The site is well arranged to make navigation easy for the player. The site has this unique feature where it utilizes your location and readdresses you to a site fit for your locality. This is a great trait as the player can easily sign up and deposit using a currency of their pick. The casinos’ support team is always available to help you with any issues you may face. 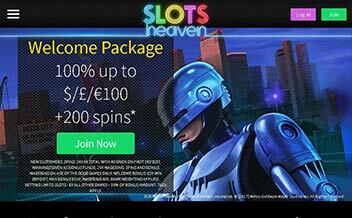 Slots Heaven Casino has a welcoming bonus of 100% and a match bonus of €100 and 200 free spins. This means that when the player deposits €100 they get a total amount of €100 to play with an addition of 40 free spins. To get the remaining free spins, the player has to register for the next 8 days and for each day the player gets welcomed by 20 spins. The casino has weekly offers every Wednesdays for the fantastic spin special. All the player has to do is choose the offer they want and place €25 amount or even more using the game’s code. The casino has mind-blowing bonuses every month for their white King game. 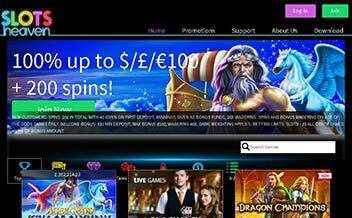 The player has to deposit €100 using the promotion code TOPUP to get 100 spins. Slots Heaven Casino has thrilling slot games. Some of the games are Superman II, White King, Stars Awakening, Upgradium, Jurassic Island, Murder Mystery, and Epic Ape among many others. The casino has amazing table games which are fun to play. Some of the games are Roulette, Blackjack, Baccarat, 3 Card Brag, Craps, Tequila Poker and Red Dog among others. 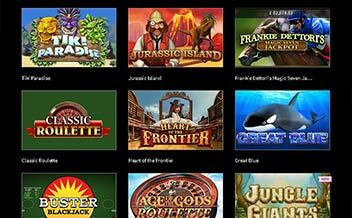 Slots Heaven Casino offers video poker games to match players’ needs. They offer single and multi-handed table games. Some of the games are Joker Poker, Deuces Wild, Jack or Better, Aces and Faces, 2 Ways Royal, and Mega Jacks. The casino’s game supplier is Playtech. Some of the restricted countries are Bulgaria, Australia, Israel, United States, France, Belgium, Portugal, Spain, Singapore, and many others. The following are methods used to deposit and withdraw Neteller, Debit/Credit Cards, PayPal, Skrill, Wire Transfer, EcoPayz, and Entropay. The currencies used in this casino are EUR, USD, GBP, and CAD. The casino website is readily available on major browsers such as Mozilla, Chrome and Opera Mini. The website is also accessible via electronic devices such as phones and tablets which makes it possible to play as you move or at your own comfort. It doesn’t have a variety of table games. The casino has built a good name for itself among its players.  It has thrilling fun games and their customer support is always available. Their welcome offers and promotions are very attractive and hard to pass. They have a quality security system and players can be assured of their security. Be part of this experience today!